Just Moved to Marbella? Or thinking of buying or renting a Home in the Area? Perhaps starting a Business? The First thing you will need when you arrive off the plane in Marbella is your Spanish NIE Number. 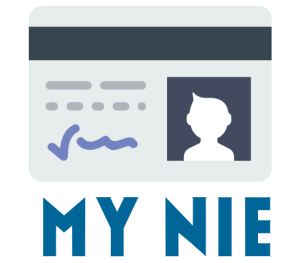 Here at MY NIE SPAIN getting you sorted out with your NIE Number,(Número de Identificación de Extranjero), the equivalent of a Spanish citizens Número de Identificación Fiscal (NIF), in superfast time is our Job. By completing just one single NIE Number booking form on our website we can organise everything from your appointment at the Marbella Police station to Your paperwork and NIE Number Tax. Your only task is to arrive at the Marbella Police station at the time and date we provide you to hand in your NIE Number paperwork and show your passport. Marbella is situated in the foothills of the Sierra Blanca, on the Costa del Sol, in the province of Malaga. A model Mediterranean resort and huge favourite with holidaymakers from all over the globe. Since the 1970s, Marbella has been renowned as a playground for the rich and famous. Yet underneath all the swagger, there is so much more to Marbella. It boasts a wonderfully cosmopolitan atmosphere and exudes charisma; attracting visitors for its many attractions: amazing beaches, warm weather, leisure facilities, including some of the best golf courses in Europe, restaurants, world-class nightlife and International luxury shopping brands. Marbella is a charming, warm and welcoming town. So it’s no surprise that time and again, it tops the most visited city in Spain list (also tops our chart for the most NIE Numbers requested in 1 week). Who wouldn’t want a piece of the action in Marbella? The beaches and enclaves of east Marbella through to the western municipal of San Pedro de Alcantara, Marbella offers so many activities and facilities, visitors have no need to venture away from the area to enjoy a full and active holiday. Shopping in Marbella: If you want to combine a beach holiday with a shopping trip, Marbella is an excellent choice. 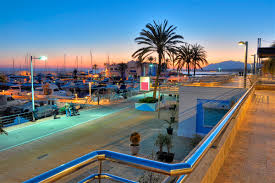 Between Marbella town and Puerto Banus you have an impressive mix of independent boutiques, luxury brands and international Spanish high street brands, such as Zara and Mango. History of Marbella: Although Marbella is a fairly modern town, it still has an interesting history and a significant architectural heritage. Museums in Marbella: Marbella might not be a big city, but it has its fair share of cultural attractions. If the day is overcast and you don’t fancy shopping, then we recommend a trip to the Bonsai Museum (Museo de Bonsai), which houses a wonderful collection of Bonsai trees from all around the world, in it’s fantastic garden-museum. Golf in Marbella: There are 10 golf courses in the Marbella area alone and over 50 in the region of the Costa del Sol. Local courses include: Rio Real, Los Naranjos, La Quinta, Marbella Club and Aloha Golf. 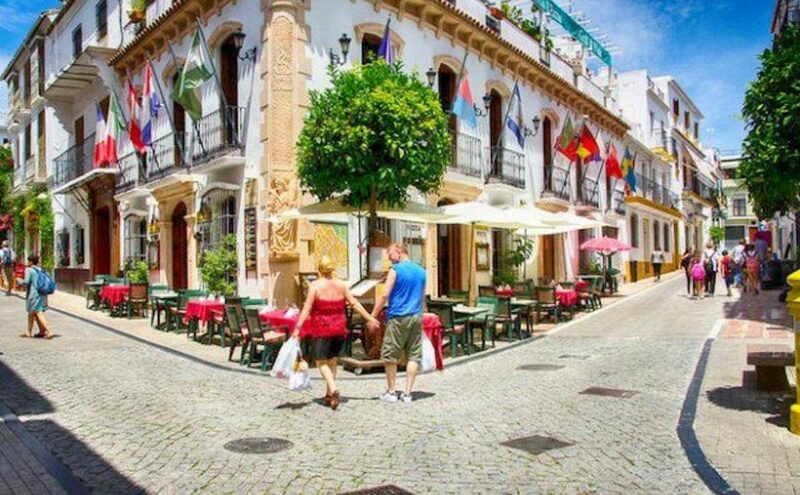 Places to visit in Marbella: In the famous Plaza de Naranja ’Orange Square’, you can while away hours, sipping sangria, taking in the beautiful surroundings and people, visiting the charming boutiques and art galleries. There are heaps of activities to keep a family occupied in Marbella, but if you want to venture out of town, pop down the road to Puerto Banus, making sure you stop off to visit some of the cool cafes and restaurants on the Golden Mile (Milla de Oro). Puerto Banus is notoriously known across the globe for its glitz and glam, chic and showy boutiques, clubs and yachting port. And it’s not far off the mark. If you have the cash to dash for a shopping spree, then here you can shop Gucci, Tom Ford, Louis Vuitton, Jimmy Choo, the designer list is endless. If you don’t have a spare couple of grand to go shopping, you still need to experience the port. During the day you can enjoy a stroll to the end of the portside, rhapsodize over the luxury yachts and then enjoy a Cosmopolitan cocktail at one of the portside bars, where you can sit on the terrace, watching the world glide by in their Ferrari. Gastronomy & Nightlife in Marbella: Whether you enjoy fine dining or traditional tapas, some of the best restaurants on the Costa del Sol can be found in Marbella, East Marbella, Puerto Banus and San Pedro de Alcantara. Traditional tapas bars, jostle with fish and seafood restaurants, beach bars, Michelin-star establishments and international diners. Whichever way you turn in Marbella, you’ll come across a restaurant. Head to the old fishing port for a plate of fried fish, clams sardines. The Old Town combines budget tapas with some real fine dining establishments. Travel Tips in Marbella: Marbella has an exceptionally mild micro climate, protected by the impressive Sierra Blanca mountain range, the winters are mild and the summer months reach 32-35 degrees. You don’t need a car, but if you want to get out of town and visit some of the region’s beaches and villages, then it’s advisable. Click here to check the weather in Marbella. 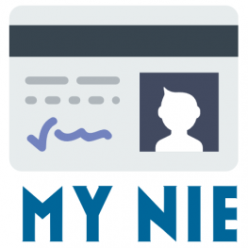 Click here to get your NIE Number in Marbella today! Next Next post: What is a Padron and do I need one to get a NIE Number?